Does it seem like there’s dog or cat hair everywhere in your home and all over your clothing? Do you find pet hair in odd places, such as your food? Is it a constant struggle to keep your home clean when you’re a pet owner? 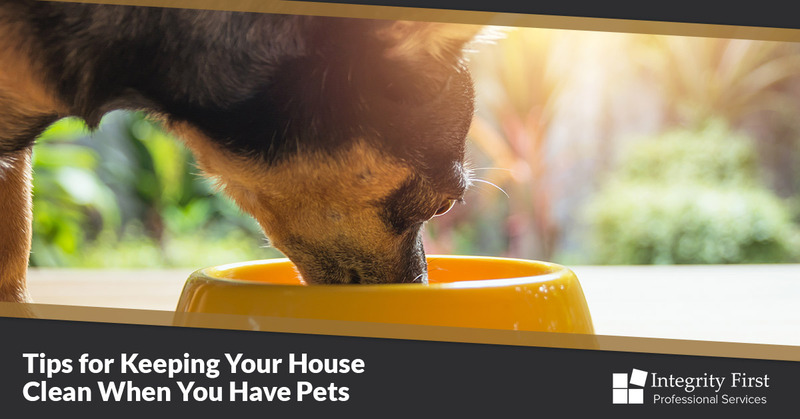 Integrity First Professional Services, the best house cleaning company in Charlotte, offers tips on how to keep your home clean when you have pets. Groom your pets frequently. Integrity First cannot emphasize this tip enough. If you want to keep pet hair off yourself, your furniture, and your floors, then brushing your pets is the key because you are removing the hair before it has a chance to fall out. Furthermore, if you have dogs and outdoor cats, they come in with dirt, mud, and sometimes bugs in their fur, which further dirties up your home. Aim for minimum once a week, and more in the Spring when they begin to shed their extra coats. Invest in door mats and towels. Speaking of dirt and mud, another way to keep your home cleaner when you own pets is to stop the mud before it enters your home. One way to do this is placing door mats at all the entrances your pets go in and out of your home. Another great investment is a towel — especially around eating time. Dogs stick their faces in their bowls and can get food and water on their muzzles, resulting in slob and dog food bits. Keep a towel near their food bowl to wipe their faces clean after feeding time. Dusting. A frequently forgotten chore is dusting. Two-thirds of the dust in your home is carried in from the great outdoors. This includes dirt, pollen, and other airborne matter. Pet hair, however, is a significant portion of the other one-third because of the fact pets have hair all over their bodies. Committing to dusting once a week will help keep your home clean and smelling fresh. Bathing. Washing your dog to remove dead skin cells, excess hair, and dirt will go a long way to keeping your home clean. However, washing your dog too much removes the natural oils from their skin that keeps their coat shiny and healthy, and can lead to dry, irritated skin. Aim for washing your dog once a month outside of the rollick in mud holes! Integrity First Professional Services believes in performing your cleaning job to the best of our abilities. Customer satisfaction is what drives us, and Integrity First ensues all of our staff are trained and professional when they perform your house cleaning service. We strive to go above and beyond your expectations. We only use green cleaning products when we perform cleaning services, which keeps you and your pets free from toxins or other irritants associated with chemical cleaning products. Whether you’re looking for a one-time service or looking for house cleaning services long term, call us today. We’ll give you a free estimate. Contact us today!